Joe & Lynne Campbell, owners and Charter Yacht Brokers of Carefree Yacht Charters®, chartered their own highly successful crewed charter yachts in the BVI for 12 years. During this time frame, they completed over 300 week long charters in the BVI. Joe and Lynne have now been on the charter brokerage side of the business for the past 8 years. With 40 combined years of experience in the charter industry plus first-hand experience on both sides of the business, Carefree Yacht Charters® will prove to be your best source of information and provide you with expert guidance on BVI Charters. Contact Joe & Lynne today about your BVI Yacht Charter. The majority of our charters are all inclusive, starting at around $15,000 per week and up to $65,000 per week. Our other category of luxury charters start around $35,000, plus all expenses. Learn more about our crewed yacht charter costs. 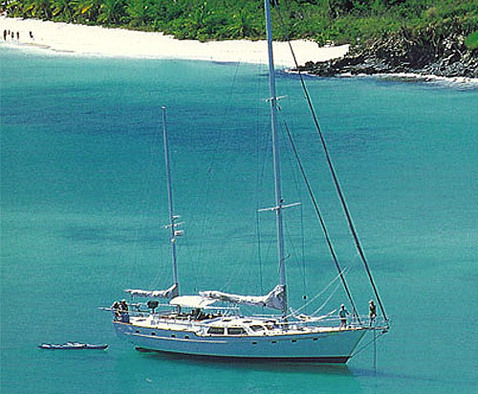 Their first yacht, IRIE, was a 46' sailing yacht and accommodated up to 4 guests in 2 cabins. This yacht provided invaluable insight with more intimate charters, including numerous honeymoon and special occasion charters during a 4 year time frame. Their most recent charter yacht, also named IRIE, was a 75' sailing yacht and accommodated up to 8 guests in 4 equal cabins. With on-deck Jacuzzi, a crew of 3, including Captain/Dive Instructor, Hostess/Dive Instructor and professional Chef, plus an all inclusive diving package, IRIE quickly became one of the most successful upper end charter yachts during their 8 years aboard her. This invaluable experience on the yachting side of the business gives Carefree Yacht Charters® an intimate and unique knowledge regarding what these charters offer and what the charter experience is all about. During their 12 year charter tenure, Joe and Lynne based IRIE in the US Virgin Islands, allowing them to gain valuable first-hand experience in US waters as well as throughout the BVI. While they based their yacht in St. Thomas, a majority of their week long charters spent approximately 90% if not all of their time in the BVI. View their BVI Sailing Suggestions based on their own crewed charters in these waters. Joe and Lynne are both PADI Dive Instructors and served as such on thousands of dives each during their crewed charter career. They stay in contact with PADI headquarters and this keeps them abreast of diving standards related to the Caribbean yacht charters they book. They can give expert advice regarding the various dive and dive instruction options available to you in the BVI as well as the yachts that feature diving. Ask them about the best dive or snorkel sites throughout the Virgin Islands. Learn more about dive charters. Joe and Lynne know the US and British Virgin Islands inside and out, above water and below. This knowledge allows them to answer the multitude of questions that will arise between now and the moment that you step aboard your charter. Learn more about Joe and Lynne and Carefree Yacht Charters®. Learn more about our BVI yacht charters. Alternatively, explore our charters in Virgin Islands, St. Maarten or the Grenadines, each offering a slightly different flair. Enjoy the British Virgin Islands or other destinations aboard one of our popular catamarans, monohull sailboats and luxury motor yachts. Learn more about our various yacht styles.